Lutein is a type of carotenoid, a naturally-occurring pigment in fruit and vegetables. Vaccinium myrtillus, known as bilberry, is a fruit-bearing plant closely related to blueberries. Several natural supplements combine these two substances for eye health. Some studies support this use, according to the University of Michigan Health System, or UMHS, although research with humans is limited. Consult with a qualified health care provider before beginning any herbal therapy. 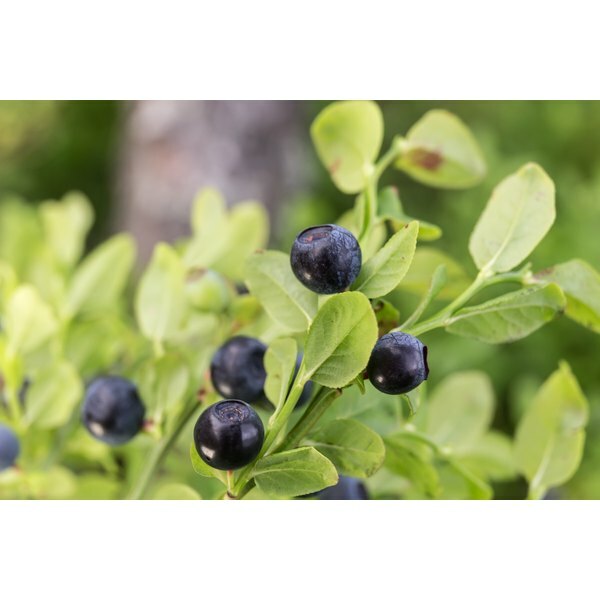 Bilberry's traditional medicinal uses include treating various eye disorders, including eyestrain, night vision difficulty and nearsightedness, medically known as myopia. Several studies with humans indicate that bilberry may improve vision and prevent diabetic retinopathy, according to the Memorial Sloan-Kettering Cancer Center, or MSKCC. Preliminary research also indicates that bilberry may prevent cataracts and may help treat mild cases of retinopathy due to diabetes or high blood pressure, and mild cases of macular degeneration, according to the UMHS. Bilberry also may decrease the risk of developing glaucoma. Lutein accumulates in the eye lens and retina, and people who eat more foods containing lutein seem to have a lower risk of macular degeneration. The UMHS cites a study in which adults with the highest dietary levels of lutein had nearly a 60 percent lower risk of macular degeneraton than adults with the lowest consumption of this substance. The UMHS notes a similar link between lutein and decreased cataract risk. To obtain lutein from food, eat vegetables and fruits, including cabbage, green beans, kale, leeks, peas, romaine lettuce, spinach, winter squash, mangoes, oranges, papayas and peaches. Egg yolk also is a good source of lutein, according to the UMHS. Certain properties of bilberry and lutein account for their beneficial activity. Lutein has antioxidant properties, eliminating harmful waste products called free radicals. It may protect the retina from oxidative damage that could result from these free radicals. Bilberry contains anthocyanins that have anti-inflammatory, antioxidant and protective effects on blood vessels. This anthocyanin content appears to make bilberry helpful against macular degeneration, glaucoma and cataracts, according to the MSKCC. Take lutein supplements with fat-containing food to improve absorption, advises the UMHS. Bilberry herbal extract is available in liquid form and in capsules or tablets, and should be standardized for 25 percent anthocyanidins or anthocyanosides. Some products combine the two for better effects. Supplements also are available including bilberry, lutein and the carotenid zeaxanthin, which is also linked to reduced risk of cataracts and macular degeneration. No negative effects from lutein supplements have been reported, according to the UMHS. Bilberry supplements are generally safe in recommended doses because most people can eat bilberries as food without problems, as noted by MedlinePlus. Large doses could lead to an increased risk of bleeding or upset stomach. Eating the fresh fruit may have a laxative effect.